FFA - The Learning Channel officially cancels All-American Muslim. Emails to advertisers made the difference. All-American Muslim. Supporters’ emails to advertisers made the difference. Florida Family Association urged advertisers in late 2011 and early 2012 to stop supporting The Learning Channel's new show All-American Muslim because it appeared to be propaganda designed to counter legitimate and present-day concerns about many Muslims who are advancing Islamic fundamentalism and Sharia law. The show profiled only Muslims that appeared to be ordinary folks while excluding many Islamic believers whose agenda poses a clear and present danger to liberties and traditional values that the majority of Americans cherish. NINETY PERCENT (90%) of the companies that Florida Family Association targeted with emails did NOT advertise again during the January 8th episode and many of the latter episodes of All-American Muslim. One hundred one (101) out of one hundred twelve (112) companies did NOT advertise again. Certainly some of the companies stopped their advertisements because of seasonal buys. However, those seasonal buyers made up a very small minority of companies that did not return to the show. That Ninety Percent (90%) and One Hundred 101 number would be higher if not for some companies that advertised during the last episode believing there would be no repercussions. The following one hundred one (101) out of one hundred twelve (112) companies did NOT advertise again after receiving emails from Florida Family Association supporters: AT&T, ADT, Airborne Vitamin, Amazon (Kindle), Amway, Anheuser Busch Inbev, Select55), Art Instruction Schools, Bamboozles, Bank of America (Cash Rewards), Bare Escentuals, Baskin Robins, Bayer (One A Day, Phillips Colon Relief), Best Buy (pTouch at Best Buy vendor ad), Big Lots, Brother International (Ptouch), Campbell's Soup, Capital One, Chrysler Group (Jeep), Church & Dwight (Oxi Clean, Kaboom), Citi Card, City Furniture, Conagra (Hunt's Diced Tomatoes), Corinthian Colleges (Everst411), Cotton, Inc., Cumberland Packing (Sweet'N Low), Del Monte (Pup Peroni), Dell computers, Diamond Foods (Kettlebrand Chips), Disney (The Muppets, Touchstone), Dyson, Estee Lauder (Clinique), Esurance, ET Browe (Palmer's Cocoa butter), Fabulous, Furniture (local), Farmer's Insurance, Ferrero Rocher, FreshPet, Galloway Ford (local), Gap, General Motors (Chevy Runs Deep), Germain Motors (local), Good Year, Green Mountain Coffee, Guthy Renker (Proactiv), Home Depot, Honda North America, (Accord, Odyssey), HTC Phones, Ikea, ITT Tech, JC Penney, JP Morgan Chase (Chase Sapphire), Kayak.com, Kimberly Clark (Kleenx), Koa Brands (John Frieda), Kraft (Velveeta), Leapfrog Enterprise (Leapster Explorer), Lionsgate, Lowes, Mars (Dove Chocolate), McDonald's, Merck & Co. (Dulera), Microsoft (Kinect, Dance Central 2), Motorola Razor, Mylife, Nationwide Insurance, News Corp (We bought a zoo movie), Nikon, Nintendo (Mariokartz.com), Novartis (Theraflu), Old Navy, Pernod Ricard (Kahlua), Petsmart, Pier One, Prestige Brand Holdings (Pediacare), Procter & Gamble (Align Probiotic, Crest, Febreze, Mr. Clean Magic Eraser, Pur, Tide), Progressive Insurance, Prudential Financial, Radio Shack, Reckitt Benckiser (Mucinex, Delsym, Resolve Clean), Ruth's Chris Steakhouse, Sandals, Sears, Shari's Berries, Signet (Kay Jewelers), Sonic Drive-ins, Southwest Florida College (local advertiser), Starbucks, Subaru, Telebrands, THQ (uDraw), T-Mobil, Toyota (Camry), Travelocity, Turbotax, Verizon Droid, Volkswagen, Vtech (Mobi Go, V Reader), Wal-Mart, Welch's Grape Juice, Whirlpool (Maytag) and Zoom Tan. Certainly some of the companies stopped their advertisements because of seasonal buys. However, those seasonal buyers made up a very small minority of companies that did not return to the show. That Ninety Percent (90%) and One Hundred 101 number would be higher if not for some companies that advertised during the last episode believing there would be no repercussions. The following companies’ responses in part are published below. Cumberland Packaging- Sweet’n Low email. Thank you for taking the time to share your concerns about our latest broadcast advertisement. We would like you to know that we did not deliberately select this program. As a small television advertiser, we purchase ads in bulk as “run-of-schedule” which enables us to take advantage of available slots on a wide variety of networks at favorable pricing. We are not a sponsor of the program nor do we have ads scheduled to run on future episodes. We are a family run business and we appreciate feedback from consumers like you, as it is helpful in our planning. Thank you again. Pernod Ricard USA Kahlua November 17, 2011 letter. You recently contacted Pernod Ricard USA regarding a complaint about our “support” of All-American Muslims, one of several TLC network shows that recently has aired our brand advertising. To clarify this matter, we don’t “support” or express any opinion on the content of the TLC network shows which air our commercials (as part of an overall network advertising buy.) However, our media buying schedule indicates we have no further advertising on this specific show. Thanks for contacting us. Jack Shea, Vice President, Corporate Communications. While we continue to advertise on various cable networks, including TLC, there are certain programs that do not meet Lowe's advertising guidelines, including the show you brought to our attention. Lowe's will no longer be advertising on that program. Andrew, Lowe’s Executive Support. A big THANK YOU to everyone who sent emails to companies that advertised during All-American Muslim. Your emails made a difference. A special thanks to Pamela Geller at Atlasshrugs.com, Robert Spencer at Jihadwatch.org and Bonni at BareNakedIslam.com for linking the Floridafamily.org’s call to action article on All-American Muslim. Florida Family Association urged advertisers to stop supporting The Learning Channel's new show All-American Muslim because it appeared to be propaganda designed to counter legitimate and present-day concerns about many Muslims who are advancing Islamic fundamentalism and Sharia law. The show profiled only Muslims that appeared to be ordinary folks while excluding many Islamic believers whose agenda poses a clear and present danger to liberties and traditional values that the majority of Americans cherish. Florida Family Association supporters sent a total of 1,184,447 emails to advertisers. This is a record for any action issue. NINETY PERCENT (90%) of the companies that Florida Family Association targeted with emails did NOT advertise again during the January 8th episode and many of the latter episodes of All-American Muslim. One hundred one (101) out of one hundred twelve (112) companies did NOT advertise again. Certainly some of the companies stopped their advertisements because of seasonal buys. However, those seasonal buyers make up the small minority of companies not returning to the show. We stated in our last email that “There is a fair chance that some companies will advertise during these last two episodes believing there will be no repercussions. “ A few advertisers did return to the last episode. However, the show had eight new advertisers the super majority of which would most likely have pulled off of the show after receiving emails from opponents to the program. Nevertheless, it would not be appropriate to contact these new advertisers since they have no opportunity to pull off of futures shows. TVGuide.com reports “Not airing in the next 14 days” for All-American Muslim. Click here to see the TVGuide.com report. Advertisers will not be contacted or reported from this point forward unless the show airs again as new episodes or repeats. This will also prevent supporters of the show from thanking companies that continued to advertise. A special thanks to everyone who sent emails to advertisers. Your emails made a huge difference. Thank you. Many situations were profiled in the show from a Muslim tolerant perspective while avoiding the perspective that would have created Muslim conflict thereby contradicting The Learning Channel’s agenda to inaccurately portray Muslims in America. For example the show portrayed a Roman Catholic who converted to Muslim to marry. However, there was no mention of a Muslim who attempted to convert to Christianity which has resulted in a multitude of conflicts in America and abroad. Many woman were shown wearing hijabs and many who were not, but the program did not show what happens if one of the hijab-wearing women decides to take it off. Such conflicts would conflict with The Learning Channel's agenda to inaccurately portray Muslims in America. Additionally, There is no mention of the honor killing of Jessica Mokdad who lived not far from where this show was taped in Dearborn. Furthermore, the show fails to mention many Islamic believers’ demeaning treatment of women or great disdain for non-Muslims (infidels). Robert Spencer’s article in Human Events and Pamela Geller’s article in World Net Daily regarding All-American Muslim are published below. Florida Family Association has launched seven email alerts to inform supporters about The Learning Channel’s new show called All-American Muslim which riskily hides the Islamic agenda’s clear and present danger to American liberties and traditional values. The alerts encouraged supporters to send emails to the companies that advertised during the first six weeks that the program aired. • NINETY SIX PERCENT (96%) of the companies that Florida Family Association targeted with emails did NOT advertise again during the January 1st and 2nd episodes of All-American Muslim. One hundred one (101) out of one hundred five (105) companies did NOT advertise again. Certainly some of the companies stopped their advertisements because of seasonal buys. However, those seasonal buyers make up the small minority of companies not returning to the show. • Close to forty percent (40%) of the advertising space on the January 1st and 2nd episodes were devoted to The Learning Channel self-promotions of other shows and network trades. • Numerous companies known for buying bargain advertising space collectively purchased a large percentage of the remaining advertising space. Florida Family Association will NO longer post the names of the companies that pull off the show because of intense scrutiny by opponents. Additionally, no email addresses will be posted for advertisers. Dearborn Police falsely arrested Nabeel Qureshi in 2010 for preaching Christianity at the Annual Arab International Festival. 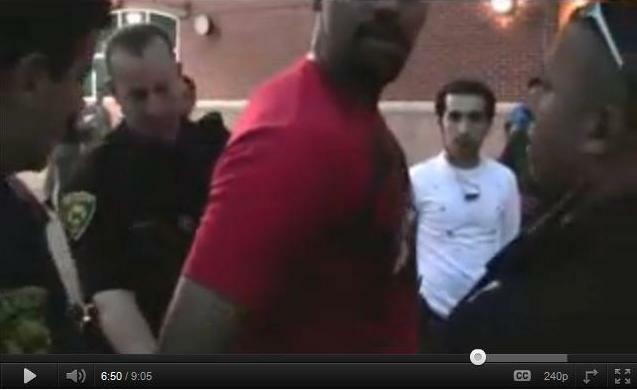 Note the ethnicity of the officers to the left and right of Nabeel who is in the center wearing the red shirt and being arrested. Click here to see this falsified arrest. The U. S. Sixth Circuit Court of Appeals ruled today that Sudanese Christian Pastor George Saieg has a free speech right to distribute religious literature on public sidewalks and evangelize Muslims during the Annual Arab International Festival held each year in Dearborn, Michigan. For five years Saieg, who specifically ministers to Muslims, had been discussing his Christian faith and passing out literature on Dearborn’s sidewalks during the Festival without encountering any problems. Nevertheless, in 2009 police officials informed him he had to remain in a booth, prohibiting him from distributing his literature on the nearby sidewalks and public streets. Dearborn is one of the most densely populated Muslim communities in the United States. It has the largest Mosque in North America. In the past few years Dearborn has gained national attention for taking a pro-Muslim stance and for the arrest and intimidation of Christian evangelists for engaging in protected speech activity. The Thomas More Law Center (TMLC), a national conservative Christian public interest law firm based in Ann Arbor, Michigan, filed the federal lawsuit on behalf of Pastor Saieg in 2009, naming the City of Dearborn and its police chief, Ronald Haddad, as defendants. The case was handled by TMLC Senior Trial Counsel Rob Muise. And so we meet one zaftig girl who loves to have fun and go to clubs, and who is in the process of getting married. Another young woman, provocatively dressed by Muslim standards, is trying to open up a club of her own. A young hijab-wearing wife shares the joy of her pregnancy with her loving husband. They’re balancing the demands of faith and family with life’s daily pressures, just like most Americans. So why – the show implies – are non-Muslim Americans so mean to them? Yet it is noteworthy that both the woman who is getting married and the one who is trying to open a club acknowledge that they are not all that religious. And that is the problem at the heart of All-American Muslim. The Muslims it depicts are for the most part undoubtedly harmless, completely uninterested in jihad and Islamic supremacism (although there is a notable undertone of something quite different here and there, such as when the career woman’s “friend and business partner Mahmoud” tells her, his voice full of quiet menace, that a Muslim woman is really better off tending to her family than opening a club). But Americans aren’t suspicious of Muslims who are trying to get married, open clubs, and play football. Americans are suspicious of Muslims who are trying to blow up American buildings, subvert American freedoms, and assert the primacy of Islamic law over American law. The problem people have with Islam is not with every Muslim person. It is with Islam’s teachings of violence against and the subjugation of unbelievers. It is with the supremacist ideology and the fervent believers in those noxious doctrines of warfare and subjugation. Left unanswered in the show is the question of what might have happened if the couple had decided to get married in the Roman Catholic Church, or to leave Islam at some later date. No doubt this non-observant woman’s Muslim relatives would have been less solicitous in that event. There are many woman in the show who are wearing hijabs and many who are not, but we are not allowed to see what might happen if one of the hijab-wearing women decides to take it off. Such conflicts would conflict with The Learning Channel’s agenda. Such a show would be far more honest in its depiction of the causes of the trumped-up malady of “Islamophobia” -- and of its remedies, for the best outcome would be a show in which the nascent jihadi was turned into the FBI by his patriotic and moderate coreligionists. But that is a show we will never see; instead all that All-American Muslim gives us is a denunciation of “Islamophobia” featuring Muslims who could never have conceivably inspired any suspicion of Islam in the first place. The show is a bait-and-switch. Sunday evening, The Learning Channel premiered its new All-American Muslim program, which it described as a “powerful series” taking viewers “inside the rarely seen world of American Muslims.” And it uncovers a “unique community struggling to balance faith and nationality.” Balancing faith and nationality”? Why is that a struggle? Because they conflict. The premise behind the creation of the show is the fictional construct “Islamophobia.” All-American Muslim is designed to counter “Islamophobia” by showing Muslims who aren’t terrorist monsters, but ordinary people living ordinary lives, balancing tradition and modern life, dealing with their families, their jobs, etc. Yet based on the most recent FBI statistics, hate crimes against Muslims are at record lows -- the lowest since 9/11. Contrast that to the record highs in anti-Semitic attacks against the Jewish people; so where’s TLC’s Jewish family series? Rosenberg complains that “so much of the conversation about Islam in America in the aftermath of September 11 has been dominated and misdirected by conspiracy theorists like Geller rather than rational attempts at dialogue and understanding.” Devout Muslims attacked this country and killed 3,000 Americans in the name of Islam; how does that make me a conspiracy theorist? But Rosenberg neglects to address the racist remarks that one character made against “white people” or the deriding of Catholics for consuming vast quantities of alcohol. I found those statements to be particularly offensive. Once again, the left shows itself to be indifferent to racism when it is committed by one of their own, and to the denigration of any religion other than Islam. The main danger of All-American Muslim is that it’s misleading. The Muslims portrayed in the show are free to choose their path. That is the beauty of living in a free society. But so many aren’t -- not only in Muslim countries, but here in America. Who speaks for Jessica Mokdad, who lived not far from where this show is taping, in Dearborn, Michigan? Mokdad was honor murdered by her stepfather, Rahim Alfetlawi, for “not following Islam” in the same city that refuses to run my freedom bus ads that offer help for those who wish to leave Islam but are threatened by their families. The ads were designed to help girls like Jessica. Despite our free speech victories in the Detroit court, which ordered the ads to run, Detroit’s SMART Transit refused to run them -- and Mokdad was honor murdered the week my ads were supposed to run. The danger is in the deception and obfuscation of the truth, which results in the intellectual disarming of the American people. All-American Muslim is trying to show nominal Muslims as the norm, as if their existence takes away the threat from devout Muslims. It is mentioned once but never explained: the man has to convert to Islam because a Muslim woman cannot marry a non-Muslim man. This is a supremacist measure designed to make the Muslim community always expand at the expense of the non-Muslim one. But there is no hint of that in this show. Clearly this program is an attempt to manipulate Americans into ignoring the threat of jihad and to bully them into thinking that being concerned about the jihad threat would somehow victimize these nice people in this show. The problem is not people, it’s ideology. The show doesn’t address that.